D6527 (33110) entered Traffic in October 1960, having been built at Birmingham Railway Carriage and Wagon Company, for the Southern Region of British Railway and delivered to 73C Hither Green, one of 98 in the class. The locomotive was transferred to 71A Eastleigh three years later in July 1963. April 1967 saw conversion to one of the 19 locos for the Bournmouth Electrification/Weymouth Line scheme which included a system of 'Push & Pull' for use with 4TC and electric EMU's. 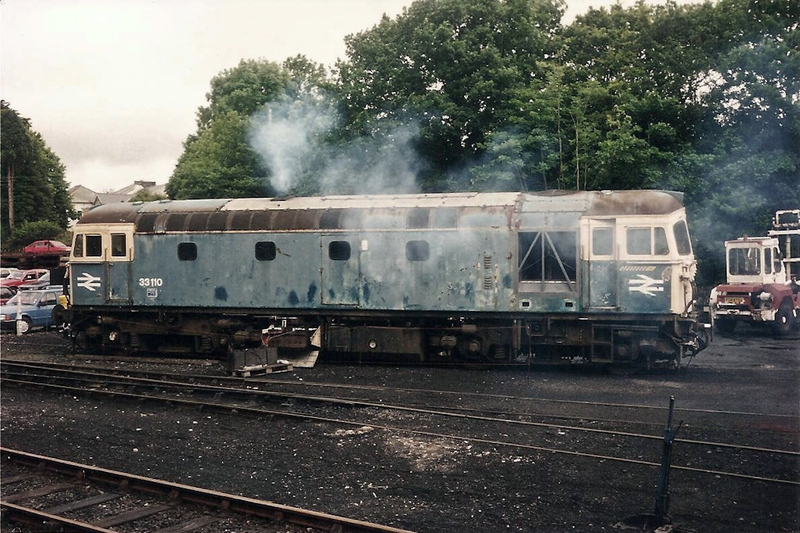 September 1986 saw the last overhaul and the latter years saw the loco in 'restricted' engineering duties before final withdrawal in Sept 1992 at Eastleigh. 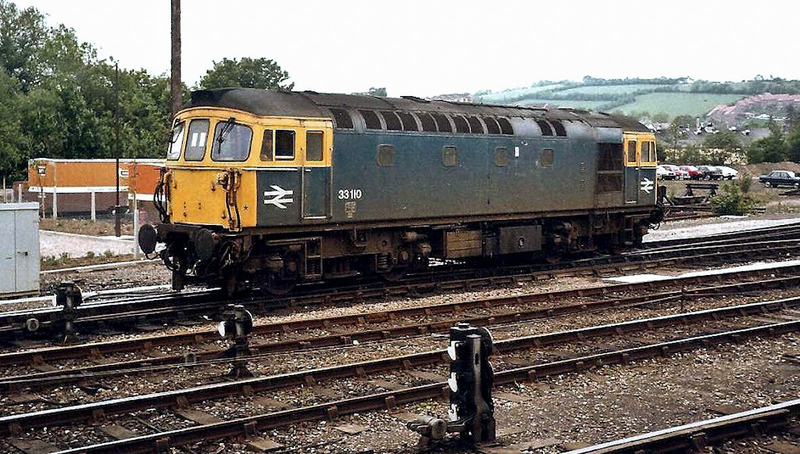 Fitzgerald Lighting and B&W Railway Director purchased 33110 for use on the Freight service then operating at Bodmin, connecting with the Mainline freight services. It arrived in December 1993 in a non working condition with many parts missing or broken. 2 x traction motors, turbo charger, hydrostatic pump, exhaust system, large parts of the air control system, heat exchanger, and inlet manifolds. One cab was wrecked, the other was in a very poor condition, with many small parts in general missing from the locomotive. With our other running loco's to maintain 33110 became a project worked on 'as and when' whilst the missing parts were sourced, purchased, overhauled and fitted. A bogie overhaul including fitting the now purchased and overhauled two 'missing' traction motors being installed (Can be seen to the right). 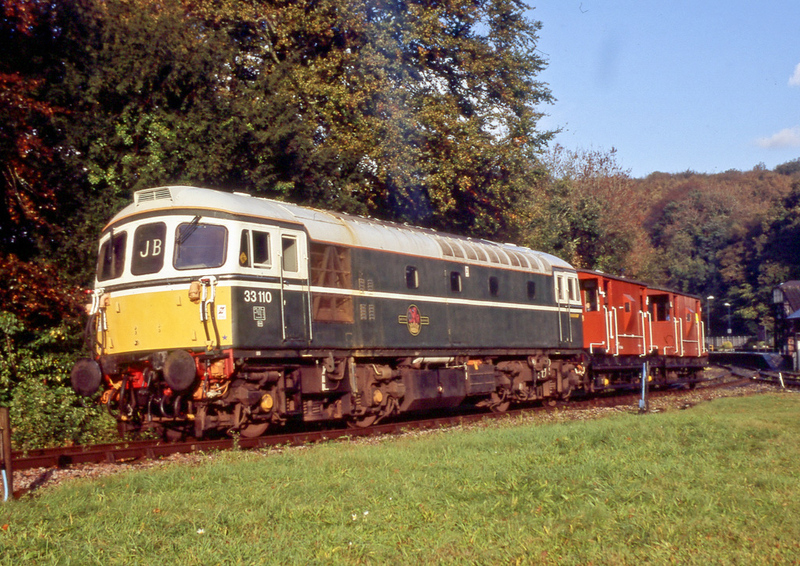 This together with the second bogie being overhauled enabled 33110 to make its first powered movements on the 6th March 2000, to Bodmin Parkway. After many man-hours of work 33110 power unit was finally fired up on 27th July 1998 for the first time in preservation, nearly six years after withdrawal from service. 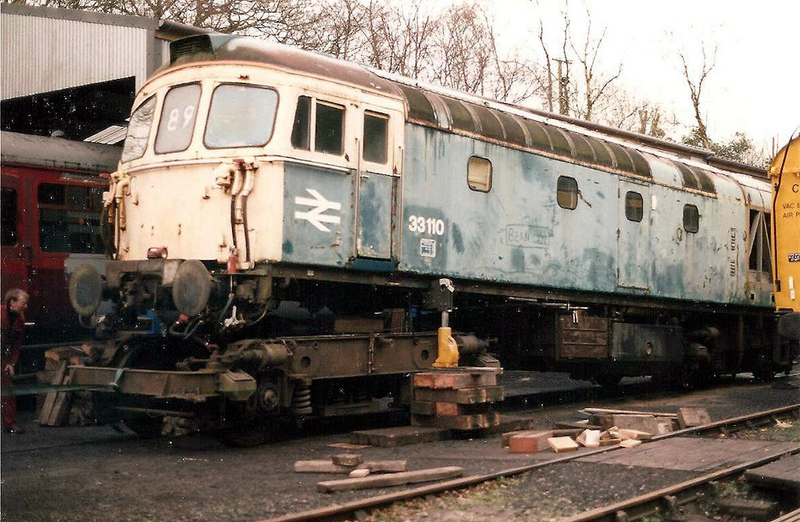 However 33110 was far from serviceable still, requiring many more hours to be spent on a number of area's namely the bogies and running gear. 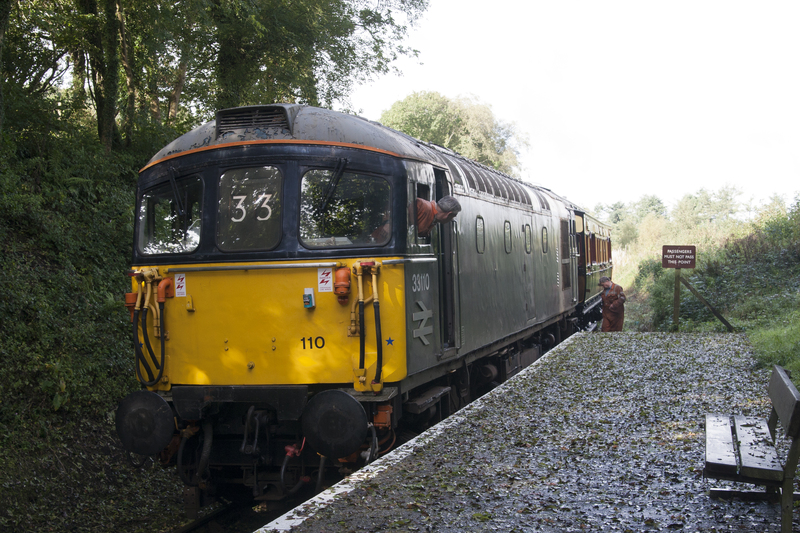 After much sweat and toil some of the members of the diesel group are seen to the right 'posing' after the first run to Bodmin Parkway on that March day and 33110 hauled its first preservation passenger service on the 27th of that month. 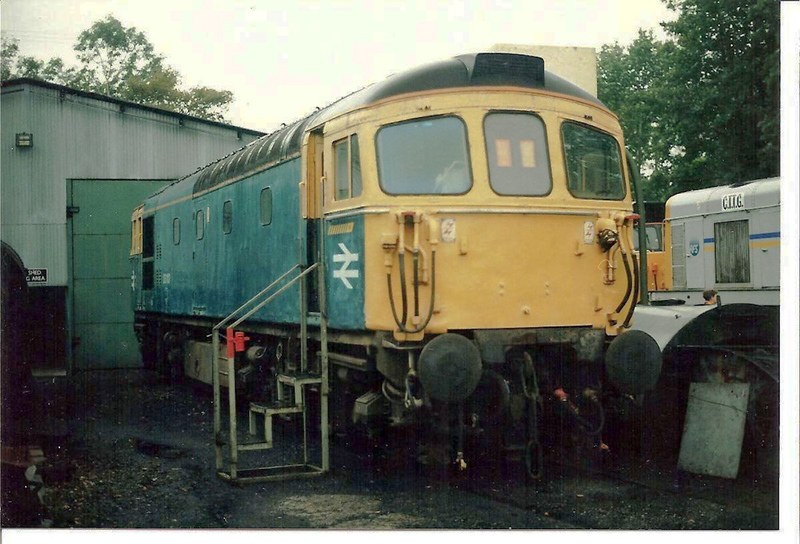 Further body work and painting took another year to achieve and saw 33110 being out shopped in BR Green livery although was shown off in primer first with 'MAINLINE' decals for the Oct 2000 diesel gala. A further workshop visit during 2008/9 sees the current livery of Engineers Grey (not ever carried by 110 but was on 109), and 33110 continues to play a large part in B&WR diesel fleet as a steady and reliable performer.